This is a photo of an Esterbrook Fountain Pen for sale on eBay. I have seen pictures of Esterbrooks before but not from this angle. It looks surprisingly like my obsidian black True Writer. Since Levenger is new to producing/distributing fountain pens, I have often wondered what pen inspired the design of the True Writer. I can't imagine a closer match than this. Update: A friend of mine recently answered this question for me. 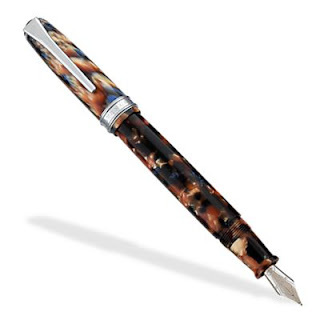 From a link on Levenger's pen page, there is a history of the development of the True Writer and they were inspired by the Esterbrook. By the way, there is a lot of good general information about pens there - recommended reading.